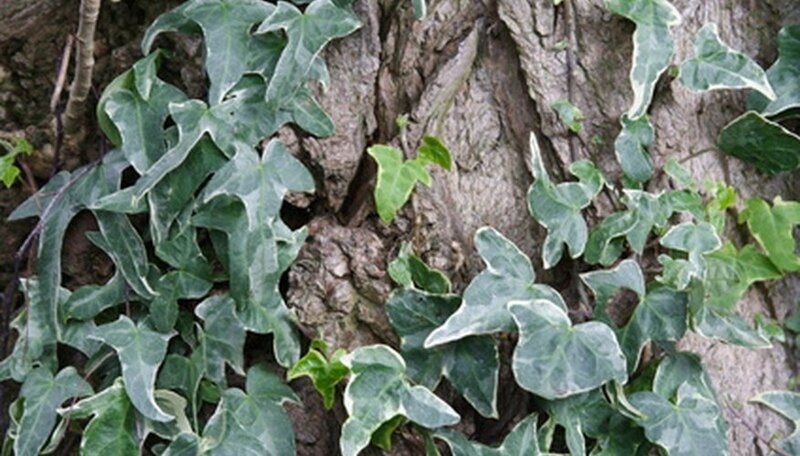 English ivy was once considered to be a refined ground cover for lawns. Many respected colleges are known as "Ivy league schools" due to the ivy that covers the buildings. However, in some states ivy is considered a nuisance. Ivy’s twining habit and lack of natural competitors has caused the plant to become invasive in some states. In these places, ivy will twine around trees and kill everything else where it grows, leaving behind what some call "ivy deserts." Removing ivy ground cover can prove challenging. Spray ivy plants with a pelargonic acid spray. Mature ivy leaves are covered with a waxy substance that prevents them from absorbing systemic herbicides. By treating the ivy with pelargonic acid, you break down the waxy coating and allow the plants to absorb an herbicidal spray. Spray ivy plants with a systemic foliar herbicide containing triclopyr. Herbicides of this nature will pull poison down into the roots of the plant and kill them completely. This will make uprooting the plant easier. Ivy leaves will turn brown and brittle, and the roots will detach from the soil easily when the plants die. Cut a 2-inch section of ivy stem from the vine of each plant per every 2 feet of vine. Treat the exposed vines with a swab of herbicide from a sponge applicator. Pull as much of the ivy plant up by the roots as you can. Ivy will return from any surviving roots that you miss. Dig any emerging young ivy plants out of the soil with a shovel. This will ensure that you get the roots of the plant and prevent future outbreaks. Remove ivy on sunny winter days when ivy plants are more likely to absorb chemical herbicide through their leaves. The long-term effects of systemic herbicides such as triclopyr are not completely known. Always wear protective clothing and breathing protection when handling triclopyr. Take a shower immediately after handling triclopyr.